Samantha G. Wolfe is an innovative marketing strategist with a passion for Virtual Reality and Augmented Reality. Sam is driven to empower companies and executives to make the never-been-done-before a reality. As a Managing Partner at We Are Phase2, Sam works with emerging tech companies to strengthen brand positioning, establish marketing strategies, and help secure revenue generating partnerships. Always on top of the most innovative tech trends, she also works with agencies and brands to integrate new technology into multi-platform advertising campaigns. 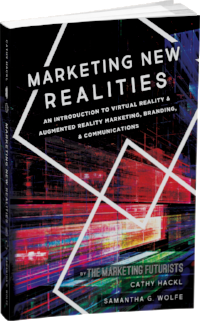 Sam co-authored the book, “Marketing New Realities: An Introduction to Virtual Reality & Augmented Reality Marketing, Branding, & Communications” and is a contributing author to Charlie Fink's new book "Convergence: How The World Will Be Painted With Data." Sam has presented at SXSW, the NYVR Expo, the Virtual Reality/Augmented Reality Association (VRARA), the Miami Ad School, the Public Relations Society of America (PRSA), the VR Voice, and at AWE (Augmented World Expo). She also runs the VR/AR/MR Marketing & Branding Facebook group which has over 2.2k+ members, the Marketing Emerging Tech group, and is a Board Member of NYVR Expo and SXSW Pitch. Sam started her career in television. She has managed B2C and B2B Marketing and Branding campaigns for Showtime Networks, Food Network, Cooking Channel, TV Guide, Rovi (now TiVo), and RLTV. Her team's branding and marketing efforts have been recognized with a North American Effie Award and a European Transform Award. and included Nikki Roth from Google), Dulce Baerga of Dulce.com, Leila Amirsadeghi from One Dome, and Jenna Seiden of Beat Games. Here’s a live video of the panel. Sam moderated Virtual Advertising panel at the NYVR Expo (where she is also a Board Member). The panel featured Michael Rucker the co-founder of OmniVirt, Samuel Huber the Founder of Admix, Tracy Quitasol the Managing Director of OMD, Create part of Omnicom Media Group, and Jerrod Goodman, Google’s AR/VR Commercialization lead. Sam spoke at the Miami Ad School’s Wynwood location. Her talk focused on an ‘Introduction to Immersive Marketing’ and she taught a class, asking them to create a campaign for Virtual Reality Day. Sam curated the 2018 and hosted a panel at the 2019 Marketing and Advertising focused events for the NYVR MeetUp (the 2nd largest VR MeetUp worldwide). Sam manages a Facebook group dedicated to inform and empower those who work in VR/AR/MR Marketing and Branding. The closed group has over 2.2k+ members and counting. Sam presented "VR's Consumer Conundrum" at the Augmented World Expo. Her talk was focused on how to get more heads in virtual reality headsets, as VR has to be experienced to be believed. ALTERED REALITY: AR, VR, & XR! Sam appeared on David Ryan Polgar and Joe Leonardo's tech panel comedy show Funny As Tech at People's Improv Theater in New York. Sam joined Tanya Laird's Digital Jam podcast with @CathyHackl and @badass_marketer to discuss the future of VR, including the impact of biomarketing, kids in VR, and biohacking the human mind. VRARA organized a large group of experts to present their thoughts on VR/AR for 10 minutes a piece. Sam presented (at 1:43) about considerations before creating a VR experience. Sam spoke with Mark Metry about the future of Marketing & Branding in Episode #17 of his podcast, Humans 2.0.